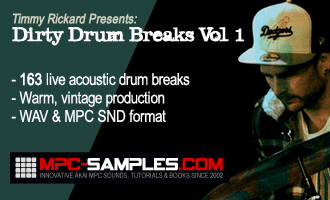 These free live drum breaks were performed and produced by UK drummer, Timmy Rickard and are taken from his live drum break collection ‘Dirty Drum Breaks Vol 1‘. Timmy was heavily influenced by the 60s downbeat funk revolution both in his playing style and his recording techniques, which is very much evident when your hear these vintage style drum breaks! Authentically recorded for a classic warm sound but with a ‘big bottom’ end to give it a modern twist. These are completely original, royalty-free drum breaks, perfect for chopping – so if you’re tired of using the same old ‘classic’ breaks as everyone else, try these out for some new inspiration. Check out the video above, which features Timmy playing one of the breaks live. If you like the free live drum breaks, check out the full sample pack at MPC-Samples.com, which contains 163 live drum breaks in tempos from 85 to 120 bpm in WAV format.